A picturesque state, with a breathtaking panoramic view of Himalayas, Uttaranchal promises its tourists a visit full of fun and unforgettable moments. The tourism industry is a major contributor to the economy of Uttaranchal, with the Corbett National Park and Tiger Reserve and the nearby hill-stations of Nainital and Bhimtal and several other hill-stations like Mussoorie, Almora and Ranikhet being among the most frequented destinations of India. Tourists from different parts of world visit Uttaranchal to enjoy sports like Skiing and Trekking.The slopes of Garhwal and Kumaon covered with seasonal snow become the perfect place for skiing in the winters. The main sites for skiing in Uttaranchal are Auli, Dayara Bugyal, Mundali and Munsyari. Uttaranchal is gifted with thick forests and jungles across the state. Jim Corbett National Park, Rajaji National Park and Nandadevi Wildlife Sanctuary are the three largest sanctuaries of Uttaranchal. Uttaranchal with its many snow covered peaks is an excellent destination for trekkers. Golf is also a major tourist attraction in Uttaranchal. The golf course around Upat in Ranikhet, is a 9 hole golf course. It is set amidst the fruit orchards of Ranikhet and has a splendid view. Uttaranchal’s land blessed with magnificent glaciers, majestic snow-clad mountains, gigantic and ecstatic peaks, valley of flowers, skiing slopes and dense forests, this Abode of Gods includes many shrines and places of pilgrimage. 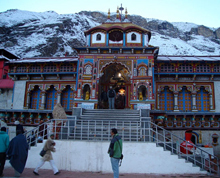 Char-dhams, the four most sacred and revered Hindu temples: Badrinath, Kedarnath, Gangotri and Yamunotri are nestled in the Mighty Mountains and pilgrims have been visiting these temples for the past 2000 years now. 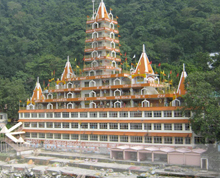 Rishikesh near Haridwar has many spiritual and yoga centers. Gangotri and Yamunotri, the sources of the Ganges and Yamuna also fall in this region and are revered by many. Besides these most popular pilgrim centers, the state has an abundance of temples and shrines, references to most of which can be found in Hindu scriptures and legends. The architecture of most of these temples is typical of the region and slightly different from other parts of India, the ancient temples at Jageshwar being the most popular for their architectural importance.